Each journey to single motherhood is unique. Some become Solo Moms by choice, others because of the end of a relationship, divorce, or death. No matter what our stories, there is one thread that connects us all: we are raising children without fathers in our homes or, for some, in our lives. 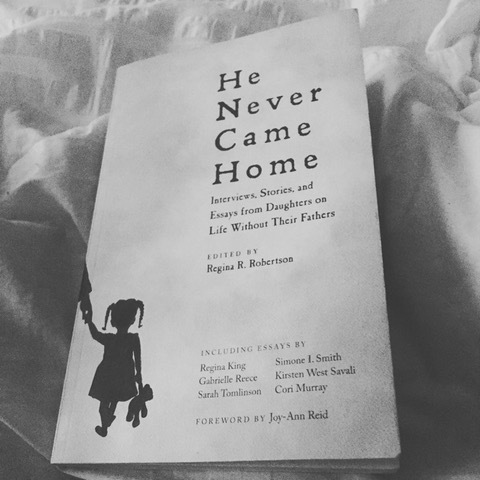 About a year ago, I began hearing about a book called He Never Came Home: Interviews, Stories, and Essays from Daughters on Life Without Their Fathers edited by Regina R. Robertson (Agate Publishing, 2017). Shortly thereafter, every time I turned on a television, there she was, interviewing about this anthology compiled by women who’ve experienced fatherlessness in some form or another—a topic that resonated with me, as I’d been raised without mine since the age of three. At the book’s end, I found myself thinking about the cherished gift daughters such as Savali and comedy writer and producer Jenny Lee had in their fathers despite losing them prematurely. As Lee expresses about her father, whom she lost to suicide: “I don’t feel sorry for my fatherless self as often as I did when I was in my twenties. When those feelings come up these days, there are a few questions I ask myself. Is it better to have a crappy father for a longer time or a good father for a shorter time?” Those tributes and others in this section of the book remind me of the exquisite love that exists between many daughters and fathers, something I’ve always disregarded because that has never been true for me. This poignant and heartfelt work left me feeling deeply connected to and strengthened by the legions of other daughters forced to navigate this world without fathers. I now realize that for some fathers, it is easier to walk away from their children rather than sift through the ruins of their own fatherless childhoods. Perhaps that was true of my father. Perhaps this also explains the apathy I felt at 39 years old when I learned of his death via a Facebook message. My disconnection was the proxy for his decades of absence. I had long ago stopped missing what I never had. What role did your father play in your upbringing?